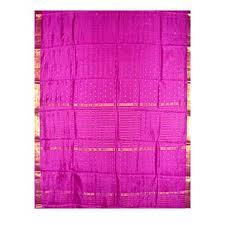 Pochampally sarees are the famous sarees woven in Pochampally, a small town in Andhra Pradesh. Pochampally is the well known brand in south india because of its quality. These sarees are world famous because of its unique design and colour combination.The Pochampally Ikat sarees have a good market in India and abroad because the weavers use modern synthetic colours and create exclusive designs that are typical of the saree tradition. Characteristic features of Pochampally Ikat sarees lie in the big, bold and bright patterning. The modernization of thought and choice has inspired the artisans to create modern motifs that are abstract, modernist and geometric, with plenty of brilliant colours. The most modern Pochampalli Ikat designs have origins in the rumal. The majority of Pochampally Ikat sarees are vibrantly coloured, however, and although there is a wide range of modern designs. 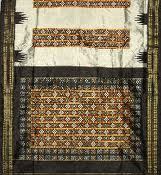 Most of the designs still follow the rumal layout with wide plain borders, one or two plain bands marking the endpiece, and a field covered with Ikat-created designs. The famous Pochampally ikat tie-and-dye saree has won Intellectual Property Rights protection. It is the first traditional Indian craft to receive this status of geographical branding. The design won protection in the Geographical Indications category. This will protect the pochampally handloom saree from unfair competition and counterfeit. 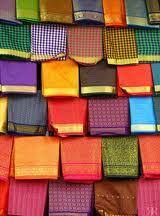 Mysore is the home of all famous feminine wear silk sari in india. Mysore Silk is a trademark for the silk sarees produced by KSIC(karnataka silk industries corporation). The distinguishing feature of this saree is the usage of pure silk and 100% pure gold zari (a golden coloured thread containing 65% of silver and 0.65% of gold). Lately many makeover steps have been attempted to make this coveted silk sari even more admired by infusing kasuti embroidery and bandhini designs, or adding on richness in the woven pallus. A wide palette of exciting vibrant colours like lilac, ecru, coffee-brown and elephant-grey have also been introduced.This saree will give you a buttery soft feeling with its rich crepe silk material. Patola silk is often termed as the queen of all silks. 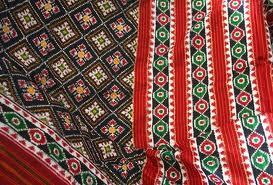 The Patola saree produced in Patan, North Gujarat, is another type of saree that is well known. These sarees are handwoven and involve traditional patterns such as leaves, flowers, parrots and dancing girls. 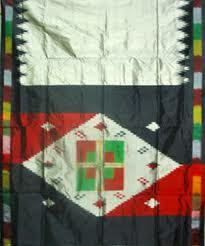 Patolas are generally produced in the red color with white, dark green and yellow patterns. Patola sarees are also considered to be wedding sarees. Simple traditional looms are used for weaving and natural dyes made from vegetable extracts and other natural colors are made use of. These colors are fast and do not fade easily. Rajkot Patola: This is only vertically resist dyed (single ikat). Patan Patola: This is horizontally-resist dyed (double ikat).The designs of this saree principally fall into three types that comprise purely geometric forms, reminiscent of Islamic architectural embellishments and ajrak (complex geometric print designs of the Sind), such as the navaratna bhat (nine jewels design). Great blog!! Beautiful collection of Indian silk sarees and nice photos.